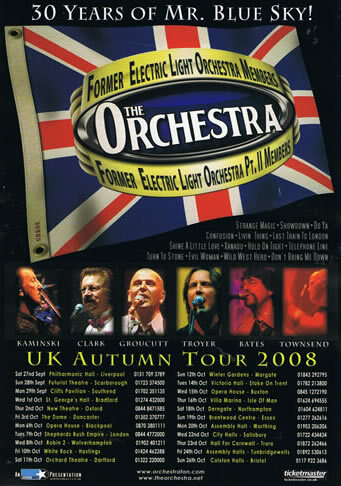 Here is my review of the superb concert performed by 'The Orchestra' at the Opera House in Blackpool on Monday, October 6th 2008. 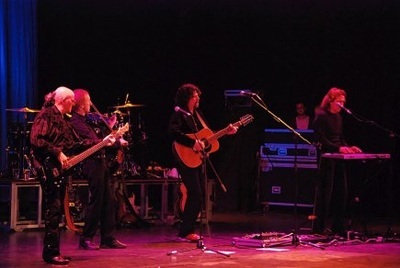 This was my fourth Orchestra gig of 2008, having been to Manchester, Newcastle and Glasgow to see the band during the Spring tour. However this was the only one I was to attend during the Autumn tour. Myself and my son Ben travelled down from Carlisle mid-afternoon on a surprisingly warm, sunny day (makes a change after the miserable wet summer we have had this year). After a huge portion of fish and chips in a local cafe we headed off to the Winter Gardens where the Opera House is based. We headed straight for the merchandise stall to see what was on offer this tour. It was a pleasant surprise to find it so well stocked with a wide selection of t-shirts, tour programme and various cd's including Phil Bates 'Retrospektiv', Eric Troyers 'Model Citizen', Orchestras 'No Rewind' and new 'live' collection and Kelly Groucutts Session 60 cd and a re-pressing of his 'Kelly' cd. Had a chat with Ken Latta, Gill and a few other fans prior to the gig and also had a quick chat with Kelly as he hung around pre-show near the merchandise stall signing items and having a few photos taken with fans. 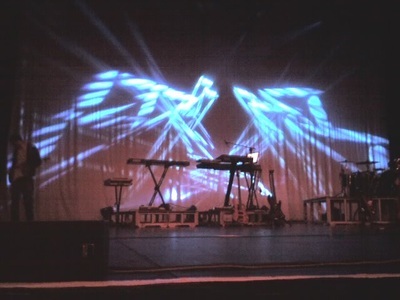 It was getting close to 7:30 so we headed off to our seats on the front row - looked like being a great view of the show! The Opera House is actually the biggest of its type in the U.K. with almost 3000 seats over the 3 levels, and it was filling up quite nicely to about maybe half to two-thirds full, certainly 1500 in at least. The lights dimmed and the new intro music started as the band came out of the shadows to take their places on stage. As the crowd cheered the band started off with 'Twilight' from the album 'Time'. Superb. Next up 'All Over The World', followed by 'Rock & Roll Is King' and then one of my favourite live songs, 'Diary Of Horace Wimp'. I love the banter between Kelly and Phil on this towards the end 'Umpa Umpa stick it up your jumper'!!! Next up was 'Wild West Hero', 'Confusion' and then 'Showdown' featuring a stunning guitar solo by Phil Bates. 'Sweet Talking Woman' up next followed by two songs from the album 'Discovery', these being 'Last Train To London' and 'Shine A Little Love'. Kelly then beckoned down Lou Clark who then introduces the band members before a superb rendition of one of my favourite tracks 'Fire On High'. The first half of the show finishes with the hits 'Livin Thing' and 'Rockaria!'. We then had a 30 minute break for the audience to have a chat about the show so far and have a drink or two in the bar!! 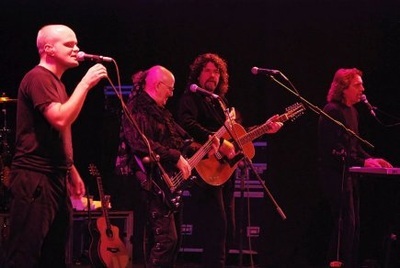 The lights then dimmed and Mik Kaminski and Phil Bates strolled onto the stage, Phil explaining to the audience that various members of the band would come and go over the next few songs which were to be performed in an acoustic style. 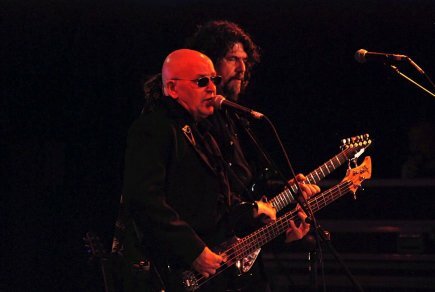 Mik & Phil starting off with 'Port In A Storm' which hopefully the guys will be playing during their upcoming 'Beatles, Blues & Blue Violin' U.K. tour in November 2008 and also in March / April 2009. 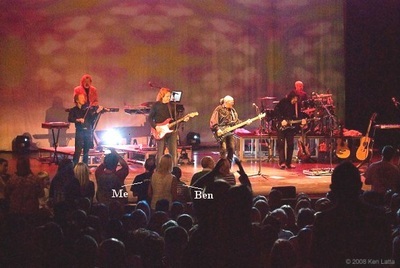 Eric Troyer then came back onto stage and introduced the next song 'If Only' from the The Orchestra album 'No Rewind'. One of my favourites this one, but just a shame it was not the full version. 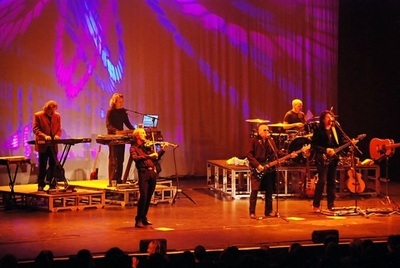 Kelly then reappeared on stage with Lou returning to the keyboards and Mik departing stage left and the guys performed a re-arranged version of 'Midnight Blue'. Brilliant!! Mik returned to the stage and explained about the next instrumental track which he stumbled across whilst surfing the internet, apparently it being a Hungarian or Bulgarian folk song which he wasn't sure what it was called so the band had named it 'Track With No Name'. Next Kelly introduced the singing drummer as Gordon Townsend stepped up to the front of the stage to introduce the next song 'Getting Better', a song by his favourite band, The Beatles. Again superbly performed and sang by Gordon and the band. Now with all band members back on stage, Kelly introduced the next track as 'a twist on twist' but not not telling the audience as it would give the surprise away for those who had not yet heard of The Orchestra's magnificent reworking of 'Twist & Shout'. The crowd loved it!! Back to the hits next with quite a few up and dancing and clapping along to 'Ma Ma Ma Belle' and 'Evil Woman'. 'Telephone Line' slowed things down for a moment before the crowd were up and dancing again to 'Hold On Tight'. 'Standing In The Rain' was performed brilliantly again followed by the classic 'Mr Blue Sky' which received rapturous applause. 'Turn To Stone' was followed by a rousing 'Do Ya' as the band took their bows. The audience remained standing and cheering until the band returned with 'Don't Bring Me Down' as the encore with Kelly and the band front of stage getting the audience to sing and clap along. And then that was it, another fantastic Orchestra concert over. We headed back off to the car straight after the show and drove off down towards the South end of the front and drove all the way back up through the excellent Blackpool Illuminations, then 100 miles back up home to Carlisle, arriving back home just after 12:30. A thoroughly enjoyable gig with these guys getting better every time I see them, and I really would recommend fans getting to see these guys if at all possible.